I don’t have a post for today. I thought I did, but when I went to do a final edit on it tonight—after two and a half hours in temple, several hours of face-stuffing, and a couple of glasses of wine—I realized I could not get it into the shape I want it and feel confident about posting it in time. Anything else I would write starting at 9 p.m. would not be worth reading (as you can see). So I apologize, but I will have what I hope is a strong post next Wednesday, and do promise to resume posts on schedule. I offer you this peculiar story, though, for your amusement. In case you can’t read the bottom, it says, “Don’t blame your body; blame your bra.” It directs you to search on youtube for a particular term, which leads to a video that tells you about a brand of bra and how they are personally fitted for women with problem chests. Was this an anonymous hit? It seems to be from a person and to me. If you’ve gotten this postcard, let me know. 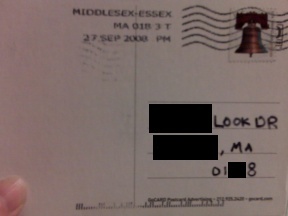 Very curious, though honestly I do have a guess based on certain clues left on the postcard, even if I can’t quite imagine how this postcard would have gotten into that person’s hands. We shall see. The more pressing questions: What is the brand that supposedly makes these miracle bras? and Where can I get one? Apparently from MyIntimacy.com or from Nordstrum’s, if you want to make your way out to Natick.